Greece and its eurozone creditors are scheduled to meet Monday in a last-ditch effort to avert a default that could shake global financial markets and result in the debt-plagued country’s exit from the euro. 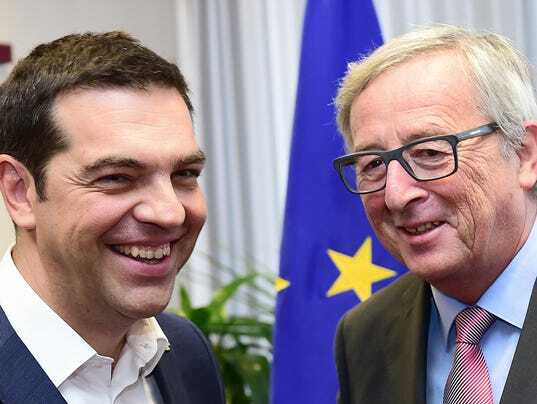 Analysts say the odds of such a scenario have increased substantially since talks between Greece and European finance ministers broke down Thursday in Luxembourg. “The risk of a deal not being secured by the end of June is very high,” economist Diego Iscaro of IHS Global Insight wrote in a note to clients. If no progress is made at Monday’s emergency summit, an agreement before a June 30 deadline “would be very unlikely,” Barclays Capital says. Greece owes its creditors — the International Monetary Fund, European Central Bank and European Commission — 1.6 billion euros in debt repayments by month’s end, which is also when the country’s bailout agreement expires. To make the payment, the country must reach a deal with the creditors to unlock the final 7.2 billion euro slice of its 240 billion euro bailout package. The creditors are insisting the country make painful budget cuts and labor market changes. “We are close to the point where the Greek government will have to choose between accepting what I believe is a good offer of continued support or to head toward default,” EU President Donald Tusk said Friday. Also Friday, Greek Prime Minister Alexis Tsipras met with Russian President Vladimir Putin and voiced optimism that a pact could be reached Monday. Barclays says the “main sticking point … revolves around pension reform, which the Greek government would find increasingly difficult to justify” to voters. Tsipras and his Syriza party colleagues were elected early this year on promises to roll back austerity measures that have crimped growth. IHS’ Iscaro says the creditors are unlikely to offer further concession and instead are more likely to present Greece with a “take it or leave it” proposal Monday. Last week, the European Central Bank extended Greek banks two rounds of emergency funding in three days as depositor withdrawals mounted. If there’s no progress at Monday’s summit, the ECB likely would mark down the value of Greek collateral, Barclays says. That, along with continued deposit outflows, could spur capital controls that limit withdrawals and the transfer of funds outside the country, similar to the constraints imposed in Cypress in 2013.